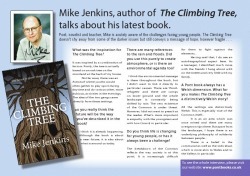 Poet, novelist and teacher, Mike is acutely aware of the challenges facing young people. The Climbing Tree doesn’t shy away from some of the darker issues but still conveys a message of hope, however fragile . . .
What was the inspiration for The Climbing Tree? It was inspired by a combination of factors. Firstly, the tree is actually based on an oak tree on the moorland at the back of my house. Not far away there was an Astroturf where youths would often gather to play sport during daytime and do various other, more dubious, activities in the evenings. The idea of the two gangs came directly from these settings. Do you really think the future will be the way you’ve described it in the book? I think it is already happening. Although the book is about a near future, it is also about what is around us today. There are many references to the rain and floods. Did you use this purely to create atmosphere, or is there an environmental agenda too? I think the environmental message is there throughout the book, but I didn’t want to link it directly to particular causes. There are ‘flood- refugees’ and there are camps on lower ground and the whole landscape is constantly being shifted by rain. The very existence of the Common is under threat. However, I did not want to preach at the reader. What’s more important is empathy with the youngsters and with Low (Lowri) in particular. Do you think life is changing for young people, or has it always been a challenge? The breakdown of the Commos reflects the way society is at this point. It is increasingly difficult for them to fight against the elements... Having said that, I do see an autobiographical aspect here. As a teenager, I identified much more with the friends I hung about with on the streets and very little with my family.